Newegg apparently getting into the holiday spirit because it is extending its Black Friday deals and more so users can buy more. The Cyber week craze will feature deals of PC Hardware and other electronics, if you missed out on the Black Friday Extravaganza then this is for you. These deals are pretty damn decent. 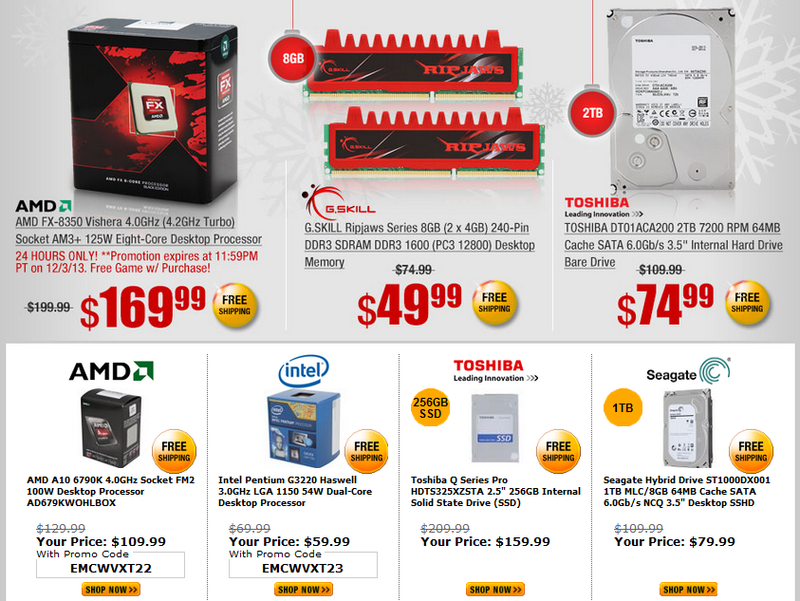 Notables one include an 8gb Ripjaws G.Skill 8 GB Kit for a bare 50 USD and a 2 TB Toshiba 7200rpm HDD for 75 USD. AMD’s Vishera FX 8350 is also in the spotlight for a bare 170 USD. All these deals can be found here. Thats not it, the page is literally flooded with amazing deals in the PC Section as well as other electronics. There is a Logitech 5.1 Surround System selling only for 78 USD! For the Audiophiles out there, a Velodyne 10” Subwoofer is actually selling for just 550 USD compared to its original price of 700 USD. One of our most favaourite deals is the ACER S275HL 1080p LED Monitor selling for 199 USD which is half its original price tag of 399 USD. Trust me i honestly cant write down all the amazing deals present there. Ofcourse prudence dictates that you dont go on a spending spree. It is wise if you are buying an item you would have originally bought anyways, because in that case you save. If you were not going to buy that item and are just going to buy it because its 50% off then you are falling right into a trap. These are amazing deals no doubt, but so is having a sense of selling tactics. The absolute best deals we found (Some of them are still available) are here and the best Gaming deals here.